UC - Sprinkler Irrigation Can Test - Estimate your sprinkler output using the "can test"
Can test Water Use it Wisely - guide on lawn irrigations that includes a can test with an interactive calculation system for your measurements and a printable guide. Improving an existing irrigation system - If you already have a sprinkler system, it's easy to convert it to a drip irrigation system. 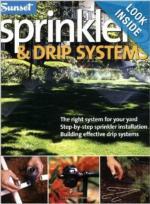 You simply use the existing supply lines and replace some of the sprinkler heads with drip irrigation supply heads. Here are some online resources that can help you learn how to convert your existing system to a water-efficient drip irrigation system. Installing a new sprinkler system - For an irrigation system to be successful, it must include proper design, correct installation, the right component selection, the proper layout, and equally important, appropriate maintenance. 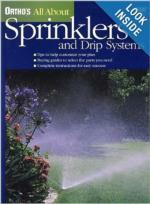 Manuals and More - Includes manuals for controllers, sprinklers and valves. Irrigation systems need regular maintenance to keep them working efficiently year after year. Damage from lawn equipment or improper winterization can cause leaks and other serious problems. Inspect your system monthly. Check for leaks, broken or clogged sprinkler heads, and other problems. Clean clogged screens and micro-irrigation filters as needed. Consider low volume, micro-irrigation for gardens, trees and shrubs. Drip (or trickle) irrigation, micro spray jets, micro-sprinklers and bubbler irrigation all apply a very small amount of water, slowly and precisely, minimizing evaporation, runoff and overspray. Winterize in colder climates. An irrigation contractor with specialized equipment will flush out water that could freeze and crack pipes, valves and sprinklers.